World wide, golf is a fantastic social and career asset. There is no better place for developing business relationships than the golf club and corporate golf events offer a huge amount of networking opportunities. Why do so many companies place as much importance on golf days for their clients? In relation to other events, golf allows participation and quality networking time over a 10 hour period, at less than half the cost of other high profile spectator hospitality at events such as football and rugby matches. Since 1987 I have organised and delivered corporate golf events in all shapes and sizes, and, in the ‘Personal Golf’ tradition, your event is quite simply designed to suit your business aspirations. 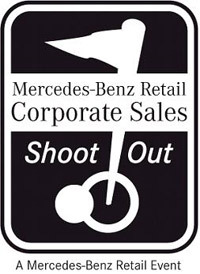 As a further example of what can be achieved on the golf course, 2008 saw the 5th staging of the exiting and extremely successful Mercedes-Benz Corporate ‘Shoot Out’. Mercedes-Benz gave me a blank canvas for this in 2003 and the result was a unique and personal tournament format which has allowed them to host around 350 guests over 10 qualifying events each year. Played mostly on Open Championship Qualifying courses, the winner of each qualifier goes on to play in the annual ‘Shoot Out’ final at Paris International Golf Club in September. Such is the success of the event, Mercedes-Benz have not only enjoyed additional car sales but they have received considerable publicity in two major golf magazines. Golf tuition days are great for helping clients improve their skills and they can even be structured to give non-golfers their first experience playing the game. Morning tuition is followed by an afternoon competition (a different one for the beginners) - the beauty of this type of day is that everyone will, one way or another, benefit greatly from your hospitality. No corporate golf day is too big or too small and I have taken events to The ‘K’ Club, Kingsbarns and Celtic Manor as well as some real hidden gems in various parts of the UK. Charity golf events are also popular and I have run charity Pro Am’s for the film industry since the late 90’s. Stephen Hanifan, Corporate Sales Manager, Mercedes-Benz Retail. In addition to providing corporate clients and guests with a great event, I can also provide a range of quality logod merchandise. All goods are carefully sourced through a number of golf’s leading companies and prices are very competitive. So, if you would like some help with your existing golf day or are not sure how to get the most out of a new personal golf event, all you have to do is give me the key details and I will do the rest.